Clear your acne in 2 minutes a day naturally, guaranteed. Is your skin care routine making your acne WORSE? You are probably already aware of the fact that excess oil is a major contributor to acne. BUT - there is more here than meets the eye. This is something that more washing just wont solve. Over drying skin with harsh chemical-filled facial washes and creams can actually make acne worse. In the short term, drying out pimples can improve acne. Long term this will make things worse. When skin is too dry your body kicks pore clogging oil - called sebum- into overdrive to compensate. 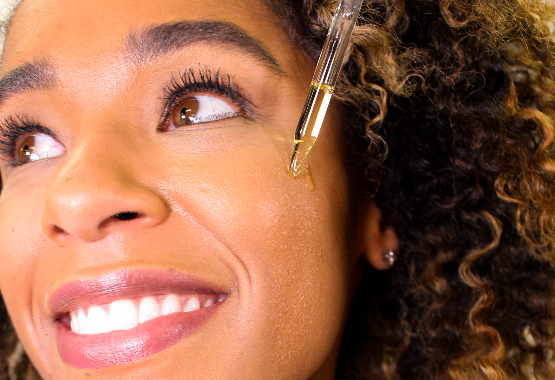 This excess oil traps bacteria in your pores. Excess oil can lead to more washing, more dry skin, and the cycle continues. There is one super oil that calms the oil secreting sebaceous glands and prevents over production of acne-causing sebum without drying out skin. It also has vitamin E that contains anti-oxidants that help remove damaged cells and help new ones grow, fading acne scars. (1) What is this miracle cure? Argania Spinosa Oil, commonly known as Argan oil. Moroccans have been using it to improve complexions for centuries, but we are just now discovering the science of just how powerful it is to fight and prevent acne. Imagine your life with clear glowing, beautiful skin! This is the acne fighting discovery you’ve been looking for. 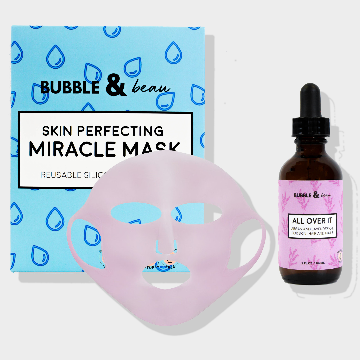 Its created by Bubble and Beau and their new All Over It Argan and Lavender Oil combines the two most effective and most natural ingredients to create a super acne fighting oil that will finally give your skin everything it needs. They created an acne fighting Clearing Kit for optimum results. Two powerful acne targeting ingredients plus a revolutionary face mask that uses micro -climate technology. When you buy the kit they offer a 90 day buy back guarantee - no questions asked. 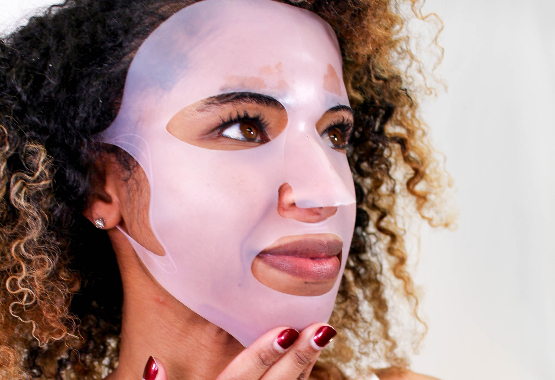 The mask is reusable so you can use it 20 times, that's only $2.30 per application with the Argan & Lavender oil. Half the price of your morning latte! “We have designed a reusable face mask that locks in moisture to create the perfect micro-climate for optimum absorption and efficacy of our oil. It was inspired by silicone scar treatments that doctors have been using for decades. This allows the oil to deeply penetrate the skin in only 2 minutes to accelerate the acne clearing and healing benefits,” said Maranda. This kit is not sold in stores and is only available for a short time. Why not get the clear skin you deserve ? Give your skin everything it needs to be clear and glowing, from the inside out! Love it, or we will buy it back. The idea for Bubble and beau came of few years ago when Maranda decided to switch to all natural and organic products. “I knew after dealing with some health issues I had to start treating my body right, and that began with eliminating conventional beauty and skin care products, most of which contain hormone and immune disrupting ingredients. I was just shocked that these ingredients were even being sold.” she says. 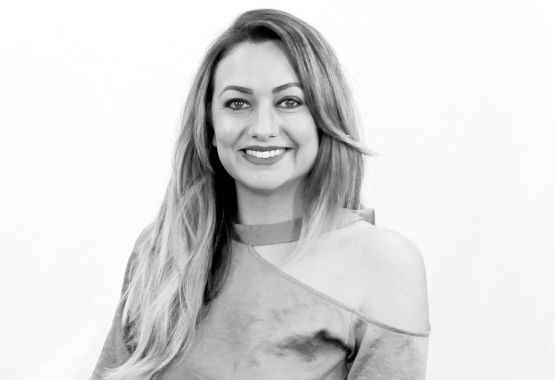 “I was also spending a small fortune on anything with organic in the ingredient list - even more if it was anti-aging” Bubble and Beau, she says, hopes to bring much need change to the beauty industry. "Real beauty is not about covering up flaws but embracing your unique features. We take purposeful all natural and organic ingredients and formulate them to give you real results that enhance and preserve your youthfulness." "I've been using the bundle for about 2 months now and my skin has never looked or felt this good! The price is amazing and the products are even better!" "Love Love Love! The miracle mask it has made a visible difference to my acne scars."